This lesson is going to introduce you to sixteenth notes and how to apply them to the Hi-Hat. 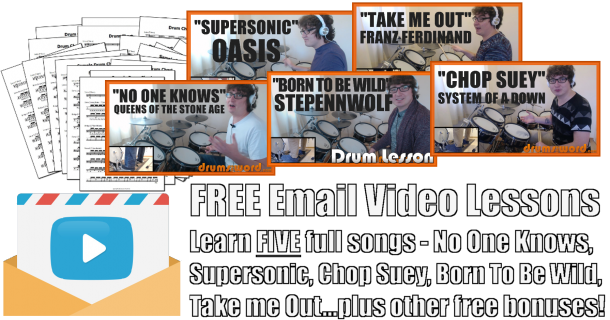 If you find that you are able to play these ideas already then you can skip straight to the intermediate lesson by clicking here. In previous lessons we have been splitting each beat of the bar up into either two notes (eight notes) or three notes (triplets eight notes). With sixteenth notes each Beat of the bar is split up into four notes. This means that sixteenth notes are the fastest sounding notes we have learnt so far. Sixteen of these notes can fit into one bar of music where previously we have only been dealing with eight or twelve notes per bar. This next section is going to demonstrate how to use sixteenth notes as Hi-Hat ostinatos (repeating patterns). A drum beat using sixteenth notes on the Hi-Hat is going to sound fast and, as a consequence, will also be harder to play at fast tempos due to the number of notes being played. It is for this reason that we are also going to be learning how to play sixteenth notes double handed (RLRL). This means that instead of using just the one hand on the Hi-Hat, two hands can be used and so faster tempos can be reached. Cool, huh? Its worth pointing out that any note speed (subdivision) can be played double handed on the Hi-Hat. The technique doesn’t just apply to sixteenth notes. Each exercise has been written as a two bar pattern. The first bar uses single handed sixteenth notes (played with your right hand on the Hi-Hat if right handed) and the second bar uses the hand to hand technique to play the same sixteenth note Hi-Hat pattern (RLRL if right handed, LRLR if left handed). Both bars will sound exactly the same apart from when the right hand leaves the Hi-Hat during the double handed drum beat (second bar) to play the snare drum on Beats 2 and 4. It’s worth pointing this out again, as this is the key to playing the double handed Hi-Hat pattern. The snare drum is played by the right hand and replaces one of the Hi-Hat notes, in other words, the Hi-Hat isn’t played at the same time as the snare drum. Think of the snare drum notes on Beats 2 and 4 as part of the double handed motion – RLRLRLR etc. When practicing these it’s worth trying to play each of the bars on their own first. Don’t try and play bar one and then bar two straight after until you’re comfortable with how each bar is played first. Make sure that the Hi-Hat notes sound even especially for the double handed Hi-Hat patterns. Note how much faster (with a little practice of course) you can play the double handed Hi-Hat bars. This will allow you to play a sixteenth note drum beat during songs of faster tempos, that if played single handed, simply couldn’t be achieved. These start to get a bit trickier because of the bass drum note at the end of the bar. Most beginner drummers find it difficult to loop a bar around if it has a bass drum note so close to the end of the bar. Try not to let it affect your playing or how well you get back to Beat 1 of the bar. These drum beats work great when played at slower tempos as the faster sounding sixteenth notes help to fill the space left by the slow tempo. The double handed Hi-Hat patterns will allow you to play the same Bass/Snare combinations but at a faster tempo. Get used to how sixteenth notes sound as they are going to become a popular note value (subdivision) to use in later lessons. Sixteenth notes can be used within drum fills to create fast and exciting patterns for example. These ideas will be looked at in the Intermediate drum lessons.